Former state representative Joe Hummerickhouse signs in to vote with Marilyn Geisy, center, and Thelma Hummerickhouse, right, at the Osage City Community Center Tuesday morning. LYNDON—Osage City saw what Kansas Secretary of State Kris Kobach predicted would be an average voter turnout on Tuesday, with 7,133 voters casting ballots in the general election. 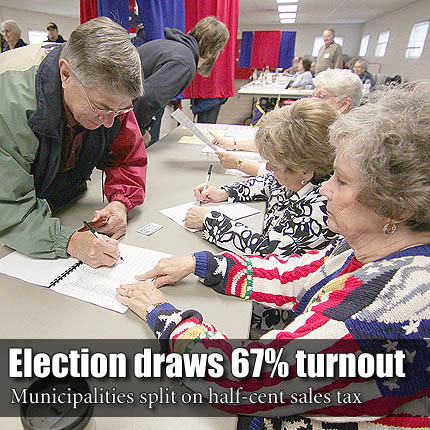 That’s equal to 67.45 percent of the county’s 10,576 active voters. There were 6,853 active voters casting ballots, in addition to 280 provisional ballots. Despite a new voter ID law that went into place, the county saw minimal problems with voters failing to produce ID. “Of 280 provisional ballots, only five of them were because of (not having) ID,” Beets said. Beets also said the polling process commenced without issue. In addition to participating in national and state races, the county solely decided to retain Osage County Sheriff Laurie Dunn by a 4,705 to 1,888 vote, as well as Osage County Attorney Brandon Jones. Three municipal ballot questions posed questions for three Osage County cities. Osage City approved a half-cent sales tax for street-related maintenance and improvements, while Lyndon rejected a half-cent hike for public works. Carbondale also resolved a long-standing issue, voting to allow the use of ATVs and related vehicles within the city limits. Unofficial county results, followed by state results, winners in bold. Totals may not reflect winners in national races. Taxation of watercraft - An amendment to allow lawmakers to classify and tax watercraft on a unique basis. Votes for the retention of district and appellate judges representing Osage County. Position No. 3 - G. Joseph Pierron, Jr.
Half-cent sales tax for public services. Half-cent sales tax for maintenance and improvements of street related infrastructure.